A relief goods storage is seen inside a subway station which is used as a shelter for emergency situation in Seoul, South Korea, August 11, 2017. Heated rhetoric between the United States and North Korea are raising concern in much of the world that a major conflict is looming, but in South Korea it is the background noise of life. Separated by the most heavily militarized border in the world, most South Koreans have lived under the risk of war. Pyongyang has repeatedly threatened to turn the South Korean capital, Seoul, into a “sea of fire” and has thousands of artillery units in place along the border to do it. But in the South, these threats have lost the power to frighten or shock, as strong military deterrence on both sides has maintained a fragile peace for more than 60 years. “Ever since I served [in the] military ten years ago, (the North Korean threat) has been continuing, and South Korean men who served in the military have developed an understanding about North Korean provocations, so we get used to it,” said Seoul resident Jang Min-seok. Last year, North Korea focused its provocative rhetoric on New York City, claiming it could “burn Manhattan down to ashes” after testing what it said was a hydrogen bomb. To back up its claim, Pyongyang has been relentlessly developing its nuclear and long-range missile capabilities to target the U.S. mainland. This week President Donald Trump joined in the war of words with North Korea in ways that critics say could escalate the already tense situation on the Korean Peninsula. 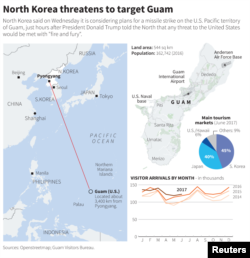 The North Korea People’s Army responded by announcing a detailed plan under consideration to launch an intermediate range missile over Japan and into the Pacific Ocean near the U.S. territory of Guam, where a major American military base is located. North Korean state media said Trump is “bereft of reason and only absolute force can work on him." And the president warned the United States would strongly retaliate against any attack on Guam. “He does something in Guam, it will be an event the likes of which nobody has seen before, what will happen in North Korea,” said Trump. There is concern among Seoul residents that President Trump’s confrontational personality might spark a conflict with North Korea that would quickly drag South Korea into the fighting. “I am worried a little bit, because it appears to be the Trump administration has an offensive characteristic,” said Kim Ki-sung in Seoul’s financial district. But any anxiety in South Korea is mitigated by the experience of living through multiple crises with the North that were eventually contained to prevent a war that would be catastrophic for both sides. U.S. Secretary of Defense James Mattis also said Thursday that while the U.S. military was "ready" for a confrontation with North Korea, his preference is for a diplomatic solution. While the South Korean government has emphasized its close alliance with the United States and the need for increased defensive measures like the U.S. THAAD missile defense system, it has not engaged in threatening rhetoric. For many residents in Seoul, this crisis seems like another act in the ongoing Korean political drama that will ultimately play out as it has in the past, with sound and fury, then restraint. “It appears to be (that the United States and North Korea) are scaring each other with words. But I don't think they can do something in reality,” said Wie Ah-rae.